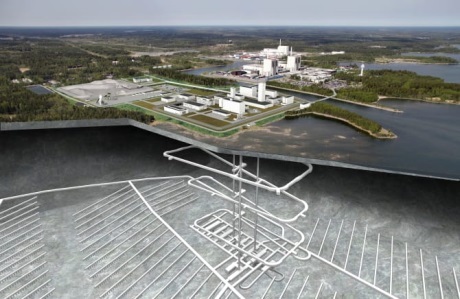 Sweden's Radiation Safety Authority (SSM) today submitted a positive opinion to the government on Svensk Kärnbränslehantering AB's (SKB's) application to build a repository for used nuclear fuel, together with a plant to encapsulate the fuel prior to disposal. However, the Land and Environment Court in Stockholm has called for further documentation on the copper capsules in which the fuel will be stored within the repository. SKB, Sweden's radioactive waste management company, submitted applications to build the country's first nuclear fuel repository and the encapsulation plant to the SSM in March 2011. The integrated facility - the encapsulation plant and the Clab interim storage facility - is referred to in SKB's application as Clink. The application concerns the disposal of 6000 capsules with a total of 12,000 tonnes of radioactive waste at a depth of about 500 meters. SKB also submitted an application to extend the storage capacity of the Clab facility from the current 8000 tonnes of fuel to 11,000 tonnes. The applications have been reviewed by the SSM and the Land and Environment Court. The SSM has considered issues of nuclear safety and radiation at the facilities as laid down in the country's Nuclear Activities Act. The review undertaken by the Land and Environment Court was based on the Environment Code. The final decision to authorise the project will be made by the government, which will base its decision on the assessments of both the SSM and the Land and Environment Court. However, before the government makes a final decision, it will consult with the municipalities of Oskarshamn and Östhammars, which have the power to veto the application. Today both SSM and the Land and Environment Court submitted their respective opinions to the government on SKB's applications. SSM recommended the government approves SKB's licence applications to construct both the repository and the encapsulation plant. "SSM considers that SKB, through its licence applications, has demonstrated that the facilities and associated safety analysis reports, or SARS, can be developed in accordance with the established procedure for a step-wise permitting process under the Act on Nuclear Activities," SSM said. "SKB is assessed as having the potential and capability to produce updated SARs covering construction, operation, and long-term nuclear safety and radiation protection, which will need to be scrutinised and approved by SSM in future steps if licences are granted by the Swedish government." Ansi Gerhardsson, head of radiation safety at SSM, said: "The Swedish Radiation Safety Authority assess that SKB has the potential to ensure the safe management and final disposal of spent nuclear fuel so that human health and the environment are protected against the harmful effects of radiation." SSM also proposed certain conditions to be attached to government licences for SKB's facilities. These conditions require that the facilities should be constructed, taken into possession and operated as specified in the applications, as well as that SKB should produce SARs for examination and approval by SSM prior to the start of construction, before test operation begins and before a facility starts routine operation. SKB CEO Eva Halldén welcomed SSM's recommendation, saying: "This is a milestone for SKB and an important step in the process of finally disposing of Sweden's used nuclear fuel safely." She added, "SSM's opinion shows that our final disposal concept, which we researched and developed for almost 40 years, is capable of meeting the very high standards of radiation safety." The Land and Environment Court has told the government it believes further documentation is required on the copper capsules to be used before a licence is issued to SKB for the repository. "SKB's assessment is solid, but there is still uncertainty about the ability of the capsule to contain the nuclear waste in the long term," the court said. "The uncertainties relate to the extent to which the capsules can be damaged by corrosion and by processes that affect the mechanical strength of the capsule. The overall assessment shows that the uncertainty about the capability of the capsule is significant and that all uncertainties have not been taken into account in SKB's safety analysis." The court said that, based on the current safety assessment, it could not conclude the repository is safe in the long term. "Therefore, the conclusion is that the final repository may be permitted under the Environment Code only if SKB reports additional information that clarifies that the repository is safe even with regard to the capability of the capsules." The activities of the encapsulation plant and the Clab interim storage facility may be permitted under the Environment Code, the court said. Halldén said that whilst SKB had not been able to provide answers to all of the court's questions regarding the copper capsules, the SSM states in its assessment that SKB has the prerequisites for meeting the requirements for radiologically safe disposal. "When we deliver the information requested, we are convinced that the government will be able to approve the final repository also according to the Environment Code," she said. The municipalities concerned - Östhammar and Oskarshamn - will now submit their views to the government, which takes the final decision on whether to grant a licence for the project. Under its current timetable, SKB plans to start construction of the used fuel repository and the encapsulation plant sometime early in the 2020s and they will take about ten years to complete.